We have been visiting most of the most exciting locations , museums and landmarks of the city. Two Urban Photography Spring Workshops and many tours and visitors have enjoyed the beautiful weather and the new re-opened locations in the city. Dani was very excited about the cameras new features and I was wondering if the weather broadcast was true. We had a great afternoon both days. the final presentation of Photojournals and Photo essays was an exciting moment, most of us had worked for about a month, thinking, planning sketching and drafting ideas around those topics we wanted for our essay. Different things showed up, as groups of images made sense aroun pink& feminity, Numbers, Doors,Mini Graffiti and People´s backs.Amazed to discover each of us point of view, and the variety of things happening out in the streets. 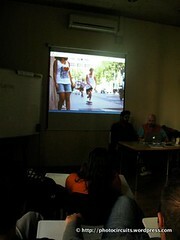 skaters, portraits, secrets, tourists, and all the diversity of the Raval on a Saturday morning. The purpose was to be able to get in touch with people and get them to pose for urban portraits. Many times it is hard for us asking people to pose for us , because we imagine they will get mad or be nasty, but that is not always true. Urban Portrait is one of the mos fascinating experiences during urban explorations. Faces and people tell us a lot a bout cities and the local life in every place. This group enjoyed breaking the fear to get in touch with people and understood ways and techniques to approach and deal with spontaneous portraits. For three weeks on Tuesday and Thursday our urban photography course took place last July. 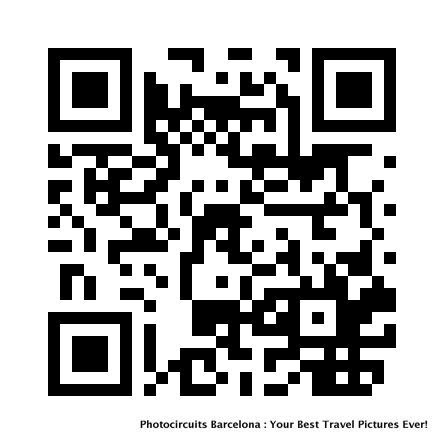 This time 19 people enjoyed the city trough their cameras and learned a little more about how to observe, capture and frame urban life in Barcelona. Some of the participants were already skilled amateurs interested in getting better images and some others were beginners with compact cameras, who today were asking advice about the new camera they want to buy. It is always a pleasure to notice people learning things they like and see them being capable of getting rid of the fear of touching buttons and changing settings in their cameras. I am always happy to get to the last session, see the results and hear them talking about apertures, composition and better colors. For me, the best session was held last Tuesday, when visiting La Boqueria market. They were starting to understand the need for observation, How to control the impulse of shooting without thinking but thinking and observing before pushing the button. We were there, looking for moments or situations that may catch our attention. But looking for this type of things never work. The way to find them, was staying still for a while and observing everything that happened around us, like being fully conscious of that place and that time. Only then, lots of incredible characters and situations showed up. Looking at the pictures the group took, I certainly got to know them a little bit better….. These were only 12 hours to short time to learn a lot but a lot of time to get closer. one of the nicest things about living in this city is that you never stop discovering places. people and situations. There is always a new story around the corner a new anecdote to recall , a new building to say wow about. And when it is not about that, it is about beautiful things that suddenly happen here. Like a cat wearing a lady hat, 4 rabbits that follow a homeless lady or a romantic couple that hold hands over 80. Street art brings lots of surprises when it invades abandoned or taken buildings and when the summer starts, it is also magic, hot but magic, the new light brings reflections and mirages that make us enjoy. here a couple of those two. Barcelona is with no doubt a city full of surprises. Some of them very evident and some of them very hidden. One of Barcelona´s more surprising spots is this roman temple we discovered with a very creative group, who were learning about depth of field and other benefits of aperture mode in their cameras. This was a perfect place to understand light, DOF and how it works. These pictures were made with a mobile phone…cameras were busy learning and enjoying.